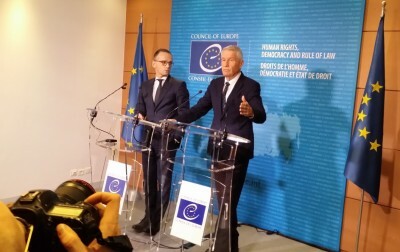 CoE SG Jagland to EF on meeting German MFA Maas, +Russia-Syria-US: "New Situation"
Home newsitems CoE SG Jagland to EF on meeting German MFA Maas, +Russia-Syria-US: "New Situation"
*Strasbourg/CoE/Angelo.Marcopolo/- Experienced twice CoE's Secretary General, Thornbjorn Jagland, f. Prime Minister and Foreign Minister of Norway, speaking to "Eurofora" on his meeting with German Foreign Minister Maas, here, just after Russia-CoE Assembly top Talks with Russia at nearby Geneva yesterday, on the issue of Russian MEPs Voting Rights/Moscow"s Financial Contribution to the organisation, (See f.ex. : ... etc), observed, inter alia, also that the recent USA President Don Trump's will to withdraw from Syria, notoriously risking to provoque there an explosive void, particularly due to Turkey's threats against Syrian Kurds combatting Islamist Terrorism of ISIS as Western and other Countries' Allies, while many CoE's Member States are involved in that Mediterranean Country, (f.ex. 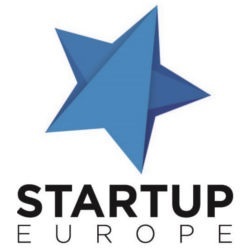 Russia, France, Germany, Italy, Turkey, etc), creates now, as far as Strasbourg's PanEuropean Institution's responsibilities and potential role are concerned, "a New Situation". German Foreign Minister Heiko Maas, from nearby Sarre, speaking earlier to Strasbourg 's Jpurnalists, including "Eurofora", acknowledged the Fact that Russia's obligation to pay its Annual Financial Contribution to the CoE, (that Moscow is currently withholding, as long as Russian MEPs are Deprived from their Voting, Participation and Speech Rights in COE's Parliamentary Assembly [PACE], by a Controversial Decision, triggered by a Minority in PACE, back since 2014, when the Ukranian conflict had been suddenly provoked, by Deadly Snipers killing both demontrators and Policemen, so that a Violent Insurrection droped the Peace Agreement compromise,signed by f. President Janukovich and all then Opposition Leaders, under the auspices of EU Foreign Ministers from France, Germany and Poland, for a National Unity Government, Amnesty, Elections, etc., to which, Eastern Ukrania Region replied with Autonomy revendications, and Russia with Crimea Referendum for ReUnification), it's certainly a Statutory duty, so that if it persists, CoE would have to take Measures against that. 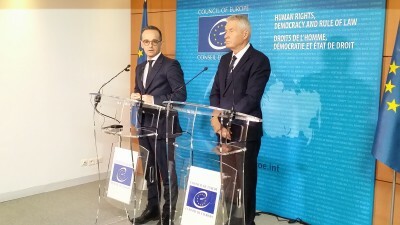 But Maas also stressed that "Russia is part of Europe" and naturaly a Member Country of the PanEuropean Organisation, while an eventual Departure out of the CoE would also Harm the Institution, and particularly those Millions of People who are now using the Protection of ECHR for their induvidual Rights : A position strongly supported also by Jagland. Therefore, a Political Solution has to be found, and that's why the German Foreign Minister is now going to visit his Russian counterparts in Moscow, as he anounced. 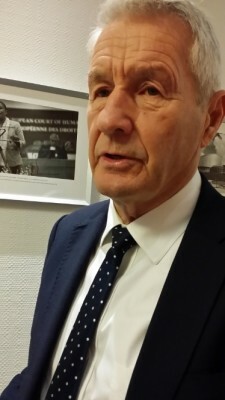 From what both Maas and Jagland told us Today in Strasbourg, it seems that efforts are currently on the way in order, inter alia, to start a kind of Process which could reach a final solution to these problems asap. Meanwhile, concerning the latest developments in Syria, and "Eurofora"'s relevant Questions to CoE"s Secretary General, (Comp. Supra), he observed, in substance, that, even if the main Mandates in those areas lies more in Other International Institutions, nevertheless, CoE might usefully contribute,:at least in certain key domains of its competence : Such as, f.ex. on Refugees, and/or new Constitution-building, etc. - In that latest matter, things ( i.e. political developments) have not yet reached such a point, Jagland noted, but, if and when they do, then, we (CoE) could do also for Syria at least what we have alteady done with several other Third Mediterranean Countries, he positively concluded in his replies to "Eutofora""s above mentioned question, (obviously hinting at CoE's "Democracy and Human Rights through Law" famous watchdog, known as Venise Commission, with currently 61 Member States covering about 1,6 Billions of Population : Comp. f.ex. ..., etc). The Wording used recently by new US President Don Trump on Syria appeared to imply that European Countries should pay a greater role there, now. This obviously includes particularly Russia. (NDLR : "DraftNews", as already send, Earlier, to "Eurofora"'s Subscribers/Donors. A more accurate, full Final Version, might be Published asap). 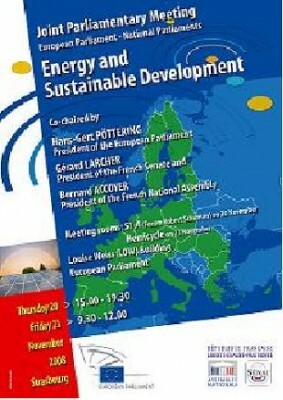 Strategically located between Paris and Prague, Strasbourg offered a natural location for the French and Czech EU 2008 and 2009 Presidencies to tune their agendas for a resolute European move towards Renewable Energies, during an exceptional Joint Parliamentary meeting on "Energy and Sustainable Development", co-organized here by the Presidents of EU Parliament, Hans Gert Poettering, French National Assembly, Bernard Accoyer, and Senate, Gerard Larcher, on November 20 and 21. Concluded by a busy-looking French super-Minister of Energy, Environment and Regional planning, Jean-Louis Borloo, the exceptional gathering of Top MPs from all 27 EU States' Parliaments hoped that a Ministerial meeting prepared by Borloo, will pave the way to an overall agreement at the level of EU Heads of State and Government Summit chaired on December 2008 by French President Nicolas Sarkozy, allowing the next EU chair, the Czech Republic, to start working from the beginning of 2009 on concrete measures. Speaking to "EuroFora" President Accoyer resumed the general feeling by stressing that "Europe has no Oil-Gas resources, but an important Scientific-Technologic potential. Therefore, we must develop Renewable Energy sources". "Since the Sun is the most abundant and free RES, we must do the outmost to boost Solar Energy" solutions, he added, at the eve of a special meeting on Solar energy and the Mediterranean organised by Borloo on Saturday. Oil-gas supplies' security and diversification were also examined by the EU gathering, after which, President Accoyer replied to our question on risks of long, expensive and fragile pipe-lines' projects, crossing through foreign countries out of the EU, compared to new possibilities for Sea and River Ship direct EU transport even of Gas, thanks to New Liquification technologies : - "We have just écreated the Union for the Mediterranean for concrete projects like these", Accoyer stressed, speaking of Sea-River Ship Highways, fundeable under EU's TENS programs. Rapporteur on "Energy innovation and sustainable development", Dr. Bedrich Moldan, vice-President of Czech Senate's Environment and Regional Development Committee, added that Climat issues, price uncertainties and diminution of accessible Fossil energies, played together with EU's RST potential in order to make RES both a need and "an opportunity". However, in cases as "Solar Energy, even if the main Scientific ideas are already here, we have to make some technologic breakthroughs in order to find how to produce it on a large scale, store and transport it", Dr. Moldan added to "EuroFora". Czech interest for RES was also expressed, earlier in Strasbourg, by Jan Kohout, the deputy Minister pf Foreign Affairs who participated to a workshop on "Renewable Energies" organized by the French EU 2008 Presidency : - "The focus is on Development", he told us. On this and other RES issues, Dr. Moldan anounced the Czech EU 2009 chair's intention to organize an important 2-days Conference on Renewable Energies and Sustainable Development late January 2009 at nearby Prague.